Day One we drove 700km into the Queensland Outback and it was here, in the middle of not much, that Brian ventured into man-scaping. 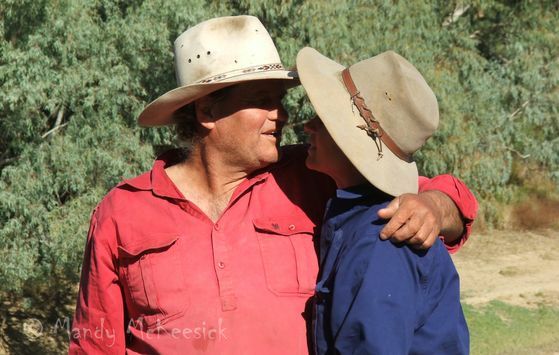 The first evening we lounged in an artesian mud bath, in a bough lined shed with a gidgee fire in the corner, the stars coming out above us and a date wine in hand. We applied a full-body mud-pack, let it dry by the fire, back into the bath with a sticky-date liquor, then under a tree shower and finished off with an all-over moisturiser. Not a bad way to start the trip. 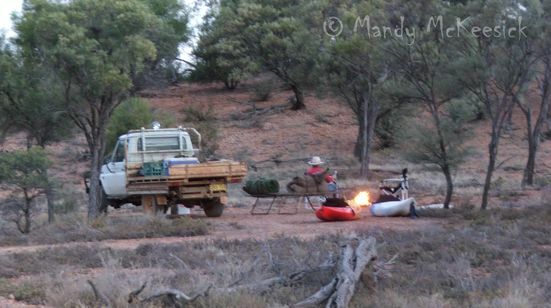 After the man-spa we found a camp by the Paroo River near Eulo and, with firewood being scarce due to the number of visitors, we cooked some sausages in foil over a small twig fire, and washed them down with rum from a battered pannikin. I slept toasty warm all night in my swag but apparently Brian froze, so the first thing we did when waking was throw the canoes into the river and start paddling. 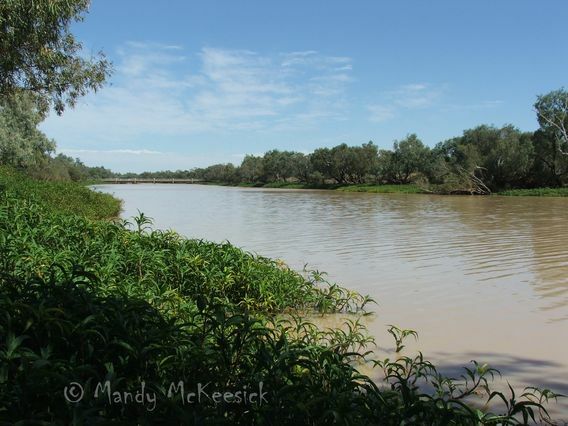 The Paroo was like a maze – islands and flooded river red gums forming channels and passages everywhere. I am happy to report that the Australians, though fading fast in the closing stages, beat the Kiwis in the Olympic Canoe Race (Paroo Division). As a couple of sausages cooked in tin foil were not providing all our nutritional requirements, we started stopping at outback pubs for a decent feed at lunch time. The first such feed was at Toompine (I hope you have all got your atlases out) where there is a hotel but no town. And wouldn’t you believe it: I was minding my own business walking across the car park when a man starts hollering at me. It was Ian (aka The Sergeant Major) from the “Letter to Pa” Ramble – ex-army, handlebar moustache, bright yellow braces, loud, a penchant for calling things darling. I probably forgot to mention he only has one leg. with more sausages cooked in foil and more rum from a battered pannikin. Day Three was Windorah and the legendary Coopers Creek. While waiting for lunch at the Windorah Pub, a flash looking 4WD and immaculate caravan pulled up. Brian commented “Jees, he must be worth a bob”. I commented that perhaps he looked across the road at our rig and thought “Jees , they must be down on their luck”. Brian just smiled and said “Nah, he’s just wishing his missus was as easy maintenance as mine.” The little ways my Kiwi says he loves me! The hardest thing about Coopers Creek was getting the canoes in the water. The banks were very steep and very muddy and we provided a comic diversion for other campers during the launch. The best thing about Coopers Creek was the birdlife – hundreds of pelicans, cormorants, herons and darters on the water, and overhead hundreds of kites (hawks). In hindsight I’m glad I didn’t catch a fish. I think I would have been ambushed. I did manage to hook an island and Brian caught a turtle. We baited the yabby net with some cat biscuits and scored a few shrimp, but they were sent back. One thing we noticed here was the amount of feral cats. They were even coming down to the river to drink as we paddled past. The Birdsville Races were just a few weeks away and as such there were lots of caravaners on the road and in camping areas. We dragged our canoes through one lucky couple’s set-up at the end of the day and shared a couple of beers with them. However the amount of people meant little firewood so once again we had sausages on a twig fire. And rum from a battered pannikin. I dragged myself out of my swag once that night – to chase off a feral cat that was into our rubbish -but ignoring the cat biscuits! 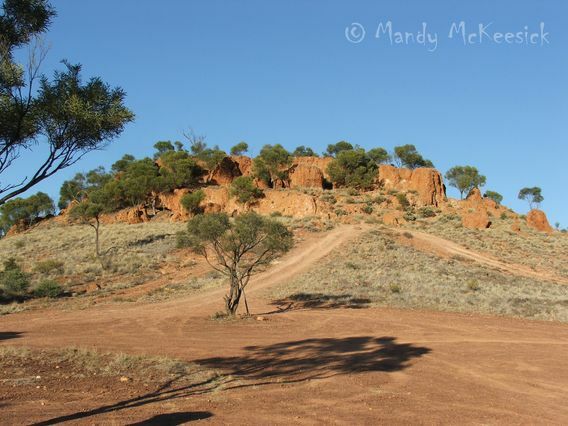 The following day we headed towards Longreach, stopping at Jundah for morning tea where The Sergeant Major pulled up alongside us. We were beginning to wonder if we were being stalked through the outback by a one-legged Vietnam-vet. dined in another outback pub, did not eat sausages and suffered through a Bledisloe Cup. At the Muttaburra Pub Brian spent an hour chatting to the Kiwi barman – his name was Sid Hale – you New Zealanders probably know him too – or are related. Then it was north to Landsborough Downs for four days of a work seminar. It was a mighty four days and very inspiring to meet with such a passionate group of farmers. Brian and I even got up and did a bit of a talk. Brian was a crowd favourite – he may have another career on the public speaking circuit. After Landsborough we had intended on paddling a few more rivers on the way home, but with the ute pointed south it was a quick trip. 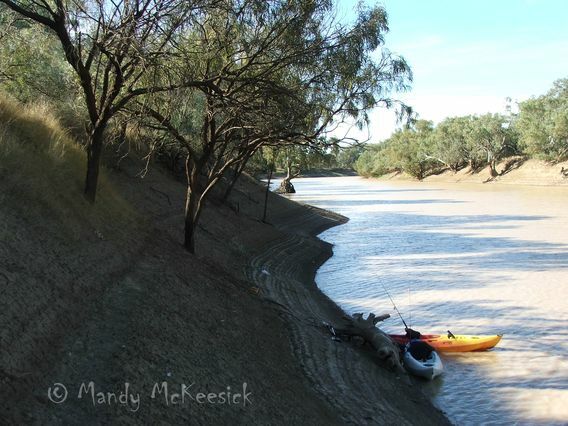 We stopped one night at Blackall were there were only disappointing puddles in the Barcoo River and a crazy woman who wanted to jump Brian for his shirt. Our last night was spent at St George where I suffered through another Bloody Slow Cup, and where the local kids (also known as hydraulics – they’ll lift anything) turned up at the motel carpark at 3am. Brian, in the nick, went outside and yelled at them. The next morning he noticed the sign outside our room “this area covered by CCT cameras” – only then was he worried. 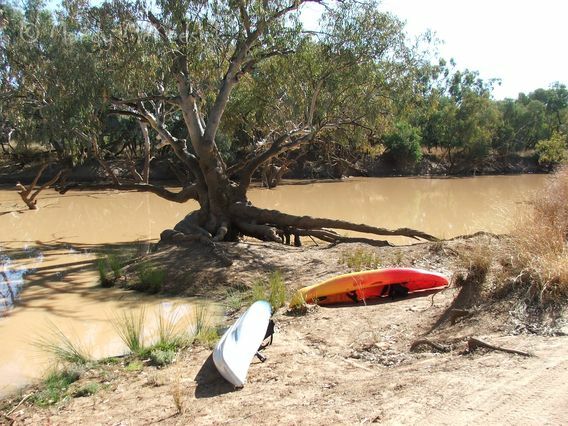 I wanted to paddle the Balonne River at St George just to say we’d done it, so we did but I nearly lost my feet to frostbite in the process. The holiday was over. Time to get back to the farm. 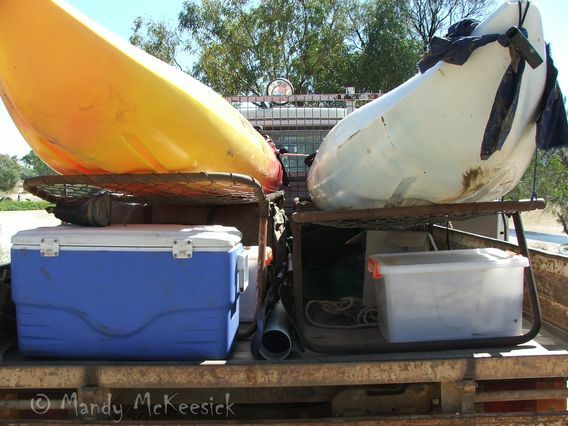 This entry was posted in Far Horizons and tagged canoeing in outback queensland, coopers creek camping, eulo mud baths, paddling outback queensland, toompine pub. Bookmark the permalink. This was a fascinating read – thank you! Love your sense of humour although I’m sure I lost some of the meanings in translation. What is a swag for example! Great sunset shot too. What an interesting holiday! It sounds fun in theory but the sausages over a twig fire happened a little too often. We did a round trip one weekend, Cairns down to Townsville and then in to Charters Towers and back up the inland road and I got so sick of sausage but I guess they are super easy. Yeah I know, harden up lol. I’d love to do the canoeing in different rivers thing, sounds fun. Yep, I too was over sausages but the rum helped wash them down! I’m usually in NZ for the “bloody slow cup” which is always amusing, though the atmosphere can get tense if the Wallabies ever show any likelihood of winning (but that rarely happens). I remember when they beat the Kiwis in Dunedin for the first time, I think there was a whole week of mourning!! Married to a Kiwi I was first indoctrinated into the Bledisloe in Broome in the early 1990s. Back then Australia actually won a few games and I have fond memories of running around a Kiwi pub gloating. And then of course I found George Gregan and rugby was much more interesting after that! Nothing like creating your adventures. Great fun (but maybe a little too many sausages for my liking). I agree Lyle – see my reply to Anne above re sausages. 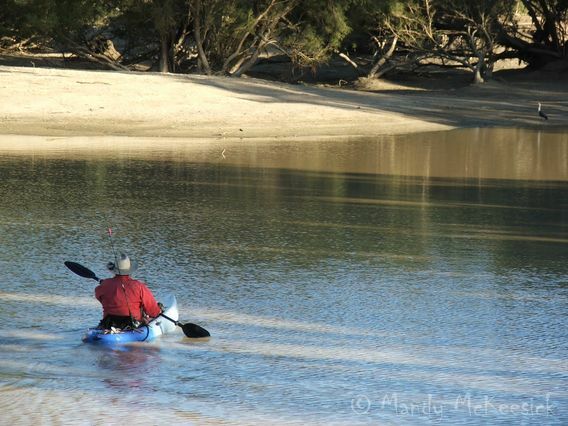 I paddle the river in St George QLD whenever I can and it is absolutely glorious and the wildlife I see is amazing. I can’t say however that the locals are how you put it….hydraulics…? ?…as I have found them to be very accomadating and an absolute pleasure to deal, It’s first time I’ve ever that term in all my visits there and can only assume that your experience was a one off considering my many experiences with that pretty little town and it’s beautiful river…amazing really…a great experience…the locals and the river!! 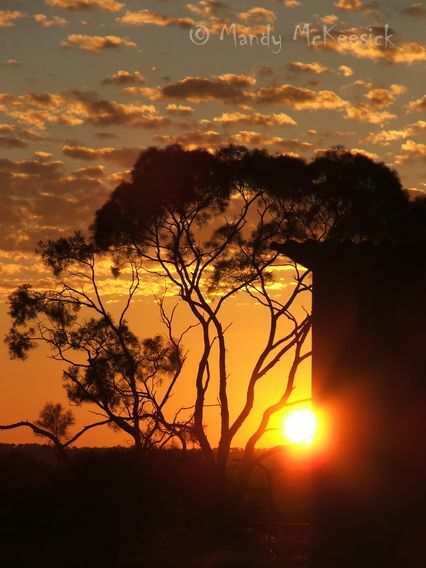 !….The local Indigenous people are an absolute delight …good on you St George…..thanks for everything ….everytime….if I was thinking about canoeing there I wouldn’t pay any attention to those “comments”,because they are not true!!!! !